Have you always wanted to fulfill your dreams of space flight without training to become an astronaut? Now you can…once you die. A few companies in the United States offer memorial space flights or space burials by launching small amounts of cremated remains into space. The cremated remains are sealed in small capsules and launched. Once such company, Celestis, offers four different options- launch to space and return to Earth, launch into Earth orbit, launch to lunar orbit or surface and launch deep into space. Increasingly, people are choosing alternatives to, or in addition to, traditional funerals as they decide how best to remember and celebrate a loved one’s life. Long gone are the days of only getting to keep a newspaper clipping of an obituary, a dried flower from the funeral service or a memorial card from the funeral home. Today there are more choices than ever before- choices that include incorporating the remains of a loved one into special, unique pieces. The ashes of a music lover can also be pressed into a vinyl record; and if available, a recording of the deceased’s voice can play on that record. A family member who loved to hunt or shoot can be remembered by having their ashes made into useable bullets. Ashes can even be mixed with ink for a memorial tattoo. 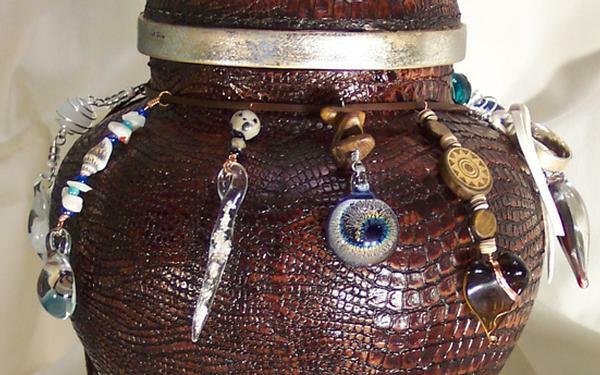 Red Manx Studio in Greeley, CO, creates necklace pendants, sculptures, sun catchers and paper weights, all made from blown glass with cremated remains mixed in. Tiffany Koehn, owner of the studio, launched her ash art line in 2009 to help people through their healing journey after losing a loved one. “God has given me the ability to help people with this. It just kind of happened,” said Koehn. About 10 years ago a friend asked Koehn, a blown glass and metal artist, to help ornament an urn for a family member. The available urns didn’t fit her loved one’s wild and vivacious personality. Working with the family, Koehn visited the deceased’s home and found some inspiration in his personal belongings. She grabbed the empty beer bottle from his last drink as well as the ashes of his beloved dalmatian. “Knowing personal information about the deceased helps me with my creative process,” expressed Koehn. She wasn’t quite sure what she would end up with, but it turned into a one of a kind, perfect piece to honor and memorialize their family member. “A dog’s ashes were the first I used, but I now incorporate animal or human ashes to make each piece. The miracle is that the ashes don’t crack the glass in the blowing process like wood, stone and even metal can. Of the 1000’s I have created over the years, all have turned out magnificent,” she exclaimed. Most pieces only require about a tablespoon of cremains, but she can use as little or as much as people request. “I incorporate a little, and families usually scatter the rest,” said Koehn. According to Koehn, she was on the front end of creating this type of art. “In 2010 I went to a national funeral director’s convention to showcase my work. No one there had heard of this type of work before. But it’s not about that to me,” explained Koehn. Koehn said she is passionate about healing art and exclusively focuses on her ash art line which now also includes hair keepsakes- locks of loved one’s hair encased between two layers of stained glass. “I create pieces to help families heal. It’s what my heart was called to do,” boasted Koehn. While traditional burials and cremation both remain popular in Wyoming and Colorado, RMLEB’s two state service area, there has been an uptick in memorializing loved ones in other ways as well. According to Jamey Kirkland, Funeral Director at Davis Funeral Home in Riverton, Wyoming, families want to do something different. “It seems to be a generational thing,” added Kirkland. He recently worked with a family that lost a baby, and they chose to order fingerprint jewelry. Davis Funeral Home has a digital scanner just for this purpose. They scan the fingerprints and upload them to the vendor’s website which in turn sends a link to the family. The family can share the link with other family members and friends, so each person can select which piece they would like to order. Kirkland also helps families reach everyone they need to inform about the death of a loved one. “Official obituaries in newspapers just aren’t the norm for our families anymore,” said Kirkland. Everdays, a newly launched app, helps families craft an eloquent message and instantly broadcasts the important news to the family’s community. “Some people struggle with knowing what to say as well as how to communicate the sad news to distant relatives and friends. Everdays makes it so easy for our families. It is much more meaningful and sentimental than just posting a message on social media,” said Kirkland. It even offers a feature to include the funeral services information in the message and then adds it to each recipient’s smart phone calendar. “We always try to offer new things to families to make sure they are taken care of. Not everyone grieves and mourns the same way, but it is important for everyone to go through the process,” said Kirkland. Rocky Mountain Lions Eye Bank works with 95 funeral homes in the region. Funeral homes play an integral role in facilitating the eye donation process and supporting donor families following their loved one’s gift of donation. Eye donation does not affect funeral arrangements, and open casket and viewings are possible after recovery. “At Davis we have a good working relationship with the eye bank as well as Donor Alliance, and we look forward to talking to families about donation. I can help answer donation questions and assure them they can still have a viewing. I think hearing it from people they know helps reassure them that donation is a good thing,” asserted Kirkland.